Electronic data is increasingly being collected in our schools without people being fully aware of what is happening. How is that data being stored and used? How might the data be used in the future, particularly sensitive data about the behaviour of children? We also need to ask about data being collected on teachers and schools. Is the collection of data on individual students in fact allowing data to be collected on teachers and schools? How might that electronic collation of data be used in the future? Recent times have brought issues about data and privacy to the public eye. A number of ‘data controversies’, including breaches from global giants like Facebook, Google and Amazon, as well as a security slipup from the huge education platform Schoolzilla, that exposed test scores of up to 1.3 million students. These issues reveal the risks of collecting human data and its potential misuse by the companies that store and use it. ‘we do not fully understand yet what all the implications of this is going to be when they are adults. Sensitive information about a child could find its way into their data profile and used to make highly significant decisions about them, e.g. whether they are offered a job, insurance or credit’. Many companies already use psychological profiling data to make decisions about who they employ. In the future they might find it valuable to view a behaviour profile developed through schooling to help assess an employee’s suitability. ClassDojo is an extremely popular classroom management app designed to help teachers with school discipline and communication. What isn’t clear to many is its voracious appetite for student data or what happens to that data. Also, it’s not clear that data on teachers and schools is being collected. New research examining ClassDojo is raising concerns about how student data about behaviour may be collected, accumulated and then used. Much like the traditional behaviour chart ClassDojo is designed to give feedback to students about their behaviour. Students are awarded positive and negative points to reinforce or discourage particular pre-selected behaviours. However, unlike traditional behaviour charts, ClassDojo creates a long-lasting record of the data it collects. With the ease of generating a behavioural report with the click of a button, it makes creating a permanent electronic or printed behaviour record simple for busy teachers. As teachers monitor student behaviour by keeping electronic records, they are also creating a data set on their own behaviour over time. Collectively such student and teacher data records could be compiled for a school. What data does ClassDojo collect? a calculated percentage score representing the per cent of positive points compared to total points received. All this data is compiled and analysed to create behaviour reports about individual students and the whole class. Reports contain red and green colour coded donut charts showing a comparison between the ‘positive’ versus ‘needs work’ behaviours. They also provide numbered statistics based on the data mentioned above, the main one being a percentage score referred to in the above list designed to represent the behaviour quality of a student or class. A major problem with creating reports like this is that they only judge students on a small number of behaviours that ‘count’. They ignore, and even deter, diversity. For example, teachers have to identify behaviours they want students to exhibit so they can monitor them using ClassDojo. Default options include working hard, on-task, and displaying grit. This list has to be limited to a number of behaviours that is manageable by the teacher to track. The selected behaviours end up being the ones that count, others are ignored, thus promoting conformity. Resembling a psychometric report, there is a concern that these ClassDojo reports may be collected by schools to create student behaviour profiles that follow students throughout their schooling. Such reports could be used to make highly significant decisions about students, e.g. whether their ‘character’ profile is suitable for leadership roles, or whether they should take certain subjects. Ultimately there is the potential that profiling in this way could influence decisions that limit or enhance future educational opportunities. We know from decades of research on the power of teacher expectations that this is an important consideration. Moreover, ClassDoJo says it ‘may also obtain information, including personal information, from third-party sources to update or supplement the information you provided or we collected automatically’. ClassDojo’s also has a messaging function. The company describes its ClassDojo’s messaging function as a ‘safe way for a teacher and a parent to privately communicate’ but this messaging function raises further concerns for us about data privacy and profiling. ClassDojo Messaging enables teachers to send text, photos, stickers, or voice notes to parents who can respond using text. It remains unclear just how private such communication really is. While ClassDojo says it does not read these messages, it declares that school ‘district administrators can request [access to] messaging histories (plus Class/School/Student Story posts) by emailing [the company]. How safe is all of this? So where does all this data collected by ClassDojo go? Two of the third party service providers involved are Amazon Web Services and MLab. They are companies used by ClassDojo to store data about its users. Amazon Web Services has a less than ideal record of keeping data stored on its servers secure. Data breaches within Amazon Web Services have exposed sensitive information about thousands of GoDaddy and Accenture customers. Because ClassDojo stores the data it collects outside of Australia, it is not subject to Australian Privacy Law. A point of difference being that US law states that companies can be forced to hand over hosted data to the government, and to do so secretly. So whilst apps like ClassDojo might be easy to use and friendly, schools need to carefully consider the potential consequences. Too much sensitive data is being collected about our students and we need to stop and critically reflect on what is happening in schools. We also need to be aware that by collecting data on students we are also creating data sets on teachers and schools. We do not know how such data sets could be used in the future. Jamie Manolev currently studies and works at the School of Education, University of South Australia. Jamie does research in School Discipline, Digital Technologies and Primary Education. His current PhD research is investigating ClassDojo as a school discipline system. Jamie also works on the ‘School Exclusions Study’ and as a Research Assistant on the ARC Linkage funded ‘Refugee Student Resilience Study’. 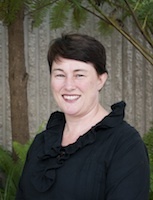 Dr Anna Sullivan is an Associate Professor of Education at the University of South Australia. A/Professor Anna Sullivan is a leading expert in the fields of teachers’ work and school discipline. She is committed to investigating ways in which schools can be better places. She has extensive teaching experience having taught in Australia and England and across all levels of schooling. A/Professor Sullivan has been a chief investigator on numerous Australian Research Council Linkage grants. Roger Slee is Professor of Inclusive Education at the University of South Australia. He is the former Deputy Director-General of Queensland Department of Education, Founding Editor of the International Journal of Inclusive Education and Journal of Disability Studies in Education, and held the Chair of Inclusive Education at the Institute of Education University of London. Australian schools are not out of control and violent behaviour in Australian classrooms is not common. Don’t believe the media beat up that has been going on for at least the last two decades. Our research confirms what teachers already know: low-level disruptive and disengaged behaviour is the main problem in our classrooms, not violence and aggression. What may surprise you is teachers feel more challenged by the small daily transgressions in their classrooms than by any other kind of behaviour. In fact teachers are more worried about students using their mobile phones inappropriately than someone being violent or abusive. Classroom management is one of the greatest concerns of teachers today. It often leads to burnout, job dissatisfaction and early exit from the profession. We conducted a web-based survey of teachers across all school sectors in South Australia to investigate the extent to which student behaviour is a concern for schoolteachers. It was open for five months and 1750 Reception to Year 12 teachers responded. using a mobile phone inappropriately. We also uncovered problems with the strategies teachers use to try to manage this low-level disruptive behaviour. Most teachers spend considerable time and energy trying to prevent students from disrupting the learning environment. The strategies they use frequently involve ‘controlling’ students to ensure their compliance. Rewards are used to promote compliant behaviour and sanctions are used to deter students from disrupting orderly learning environments. Step systems are often used and typically involve an escalation of punitive responses such as giving a warning/reminder, in-class time-out, out-of-class time-out, referral to a school leader, inschool suspension, out-of-school suspension, and permanent exclusion from school. However these attempts to control or punish the student do not address the underlying causes for a student being disengaged and ultimately may not change that behaviour. What is important is the creation of classroom conditions that promote academic engagement. Engagement is the key to establishing schools and classrooms where behaviours are more productive. We argue that if teachers gained a greater understanding of the broader ecology of the classroom and how it can influence engagement and therefore behaviour, we might see a shift in focus to engagement rather than punishment. We use our ecological approach to explain and manage both productive and unproductive student behaviour. In the ecological model we use (see the figure below) the classroom is thought of as an ecosystem involving interactions between the physical environment, teacher characteristics, curriculum including teaching methods and resources, and a multitude of student variables in examining specific productive and unproductive behaviours and teacher responses. The theoretical framework underpinning this study suggests that disengaged student behaviours have more to do with factors within a teacher’s control than with those located within the student. Teachers can consider aspects related to the physical environments, the curriculum and resources, and their teaching to engage students in learning activities. The key principle is that student behaviour does not exist in isolation but within the interaction between all elements of the ecosystem. At the whole-school level, as well as internal factors, the influences of outside factors (home, socioeconomic, political, cultural/racial/religious) impact on the ecology of the school. 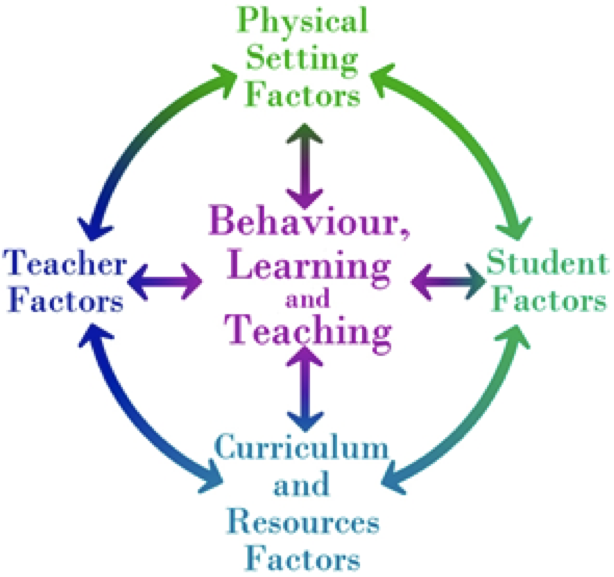 This model leads us to understand that various factors influence student behaviour and that responsibility for behaviour should not rest just with students. We believe if teachers give thought to the ecology of their classrooms they might feel less overwhelmed by the challenging behaviour they face daily. A teacher who can see and positively influence this ecology is more likely to feel a sense of hope that they can reduce disengaged and disruptive behaviour and create a more productive classroom.